Appealing to lawmakers to support the Maldives’ continued membership in the Commonwealth, vice president Dr Mohamed Jameel has said that quitting the intergovernmental body will adversely affect the Maldivian youth, women and business community. The People’s Majlis, at the request of president Abdulla Yameen, is set to debate the benefits of Maldives remaining in the Commonwealth today. Some member states are lobbying the body’s democracy and human rights arm, the Commonwealth Ministerial Action Group (CMAG), to take punitive action against the Maldives over alleged repeated violations of the organization’s principles, including the jailing of former president Mohamed Nasheed. The vice president noted that many of Maldives’ important partners are Commonwealth member states, including India, Sri Lanka, Bangladesh, Singapore, Malaysia, the UK, Australia, Canada and New Zealand. Continued good relations with Commonwealth member states is vital for the Maldives’ economy and security, he said. “It will be extremely naïve to think that snubbing an association in which our neighbours and partners play a leading role will not undermine our relations with them,” he said. “It will be particularly foolhardy to quit the Commonwealth to spite the Commonwealth Ministerial Action Group at a time when regional countries like India, Sri Lanka and Pakistan are sitting on CMAG,” he added. Jameel is meanwhile facing impeachment by the People’s Majlis. A vote is expected on July 21. He abruptly left the Maldives within a day of the parliament approving a constitutional amendment that will allow President Yameen to replace him with the tourism minister. The ruling Progressive Party of the Maldives’ attempt to impeach Jameel is the latest in a series of dizzying turn of events in Maldivian politics. 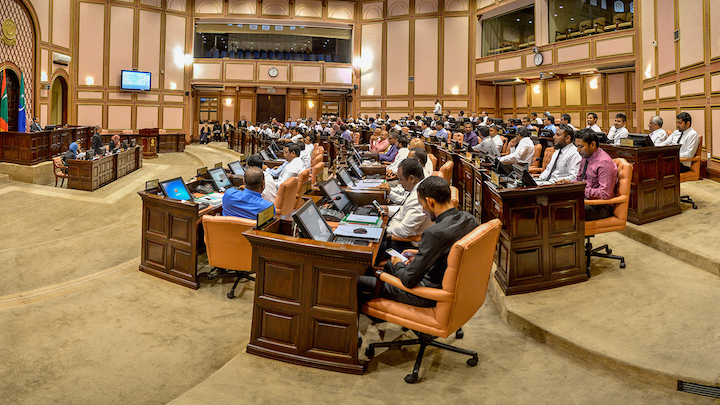 The opposition backed the constitutional amendment in exchange for opposition leader Nasheed’s transfer to house arrest. Subsequently, the opposition and the government began talks in late June, raising hope of an end to a six-month long political crisis. Diplomatic pressure has been mounting on President Yameen to release Nasheed and other jailed politicians, including two ex defense ministers, a former ruling party MP and the leader of the religious conservative Adhaalath Party. The Maldives was first placed on the CMAG agenda after Nasheed’s ouster in 2012. A Commonwealth backed inquiry found the transfer of power to be legal. As efforts to place Maldives on the CMAG’s agenda for a second time intensified in July, foreign minister Dunya Maumoon threatened to leave the Commonwealth, claiming the “country’s economy and democratic governance suffered significantly” as a result of the events of 2012. The CMAG, however, decided not to review the Maldives at a recent meeting in London. Jameel today praised Dunya for her “policy of engagement” and said her efforts had prevented the Commonwealth from taking punitive steps against the Maldives. Calling on the Maldives to foster existing relationships, Jameel noted that many of Maldives’ students study in Commonwealth countries and benefit directly or indirectly from opportunities linked to the Commonwealth. As a developing country, Maldives also benefits from various capacity building programmes in the Commonwealth, he said. The inter-governmental body plays a vital role in supporting the integration of small states into the global economy. While maritime security is an important priority for Maldives, the partners it relies on for operational capacity and effectiveness are mostly from the Commonwealth, he said. “At every major challenge the Maldives had faced over the past 30 years, the Commonwealth has proved to be a vital partner, supporting, guiding and assisting us to attain success. These include strengthening national sovereignty through the small state security initiative in 1989, claiming a vast portion of the Indian Ocean and its seabed to expand our national wealth in 2010, or in supporting democracy-building as in 2005-2008, and facilitating national healing through supporting the work of the Commission on National Inquiry in 2012,” he added. President Yameen in November 2014 had declared a foreign policy shift to the East, claiming that economic cooperation with China does not involve the same challenges to remaining an Islamic state as posed by some Western powers. The Maldives joined the Commonwealth in 1985. 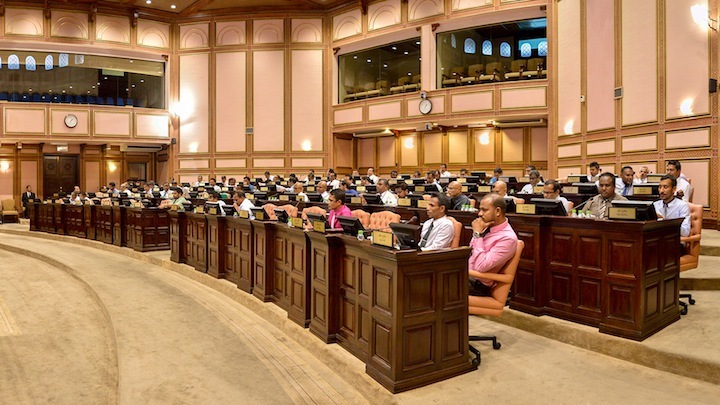 The impeachment vote has not been scheduled at the Majlis yet. But Jameel was notified of the impeachment motion on July 2 and given 14 days to respond. Rumors had spread this week that the Maumoon Abdul Gayoom, the president of the ruling Progressive Party of the Maldives (PPM) and half-brother to President Abdulla Yameen, favored another candidate. Gayoom today denied rumors he favors specific candidate in a tweet. “It is not true that I have a preference for a particular person to become vice president,” he said. It is not true that I have a preference for a particular person to become vice president. 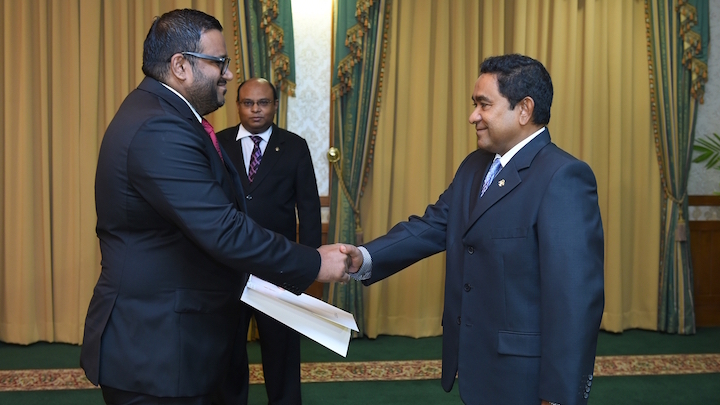 The appointment of a deputy is the sole prerogative of the president, Gayoom added. As per the Constitution the appointment of a vice president in case the position falls vacant is the sole prerogative of the President. PPM ally, the Maldives Development Alliance (MDA), also denied rumors its leader Ahmed Siyam Mohamed was interested in the position. The parliament in late June amended the constitution to set new age limits of 30-65 years for the presidency and vice presidency. The amendment bars Gayoom, who is in his early 80s and has already served six terms, from contesting presidential elections. The lower age cap makes Adeeb eligible. He is 33. The constitution had previously said that candidates must be above 35 years of age. The move appears to have widened a rift between the Gayoom brothers. Gayoom’s son MP Faris Maumoon was absent from a vote on the constitutional amendment despite a three-line whip. Faris’ absence led to a heated exchange on text messaging service Viber between the newly elected MP and Adeeb. PPM MPs have publicly accused Jameel of incompetence and disloyalty. But the opposition claims Yameen is fatally ill and wants a more loyal deputy ahead of a major surgery. The government continues to deny rumors over the president’s ill-health. 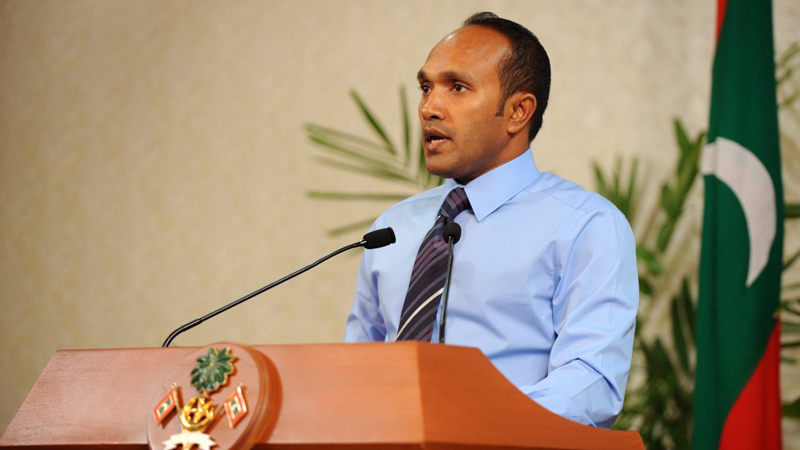 Soon after the amendment to the constitutional amendment passed, Jameel suddenly left the country. He told the New Indian Express his impeachment is a constitutional coup. Meanwhile, President Yameen, in a meeting with PPM MPs on July 7, reportedly said he does not trust his deputy and showed them Viber messages exchanged between Jameel and opposition politicians ahead of a historic anti-government protest on May 1. PPM MP Mohamed Musthafa in a tweet subsequently said the president had shown them evidence that Jameel had been planning a coup. In the messages, Jameel had reportedly asked a lead organizer of the protest if the opposition will support his takeover of the presidency if protesters were able to oust Yameen on May Day. The protest had ended with the arrest of nearly 200 protesters in violent clashes. Some 20,000 people had taken to the streets in the largest anti-government action in Maldivian history. Jameel was not available for comment at the time of going to press. The PPM has secured opposition backing for the impeachment motion with 61 signatures. A two-thirds majority or 57 votes will be required to vote Jameel out of office. The parliament has amended its standing orders to fast track the vice president’s impeachment. The main opposition Maldivian Democratic Party (MDP) backed the constitutional amendment to make Adeeb eligible for the vice presidency when the government transferred jailed opposition leader Mohamed Nasheed to house arrest. The government and the MDP have now begun talks, raising hope of an end to a six-month long political crisis. 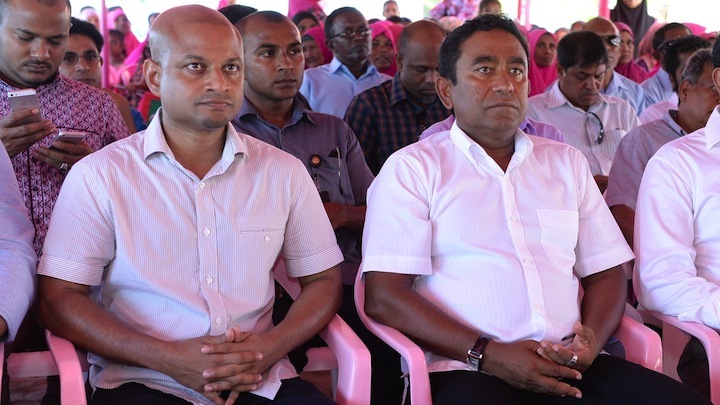 A heated exchange on a social media group set up between MPs of the ruling Progressive Party of the Maldives (PPM) has been leaked and exposes a widening rift between President Abdulla Yameen and his-half brother and president of 30 years, Maumoon Abdul Gayoom. 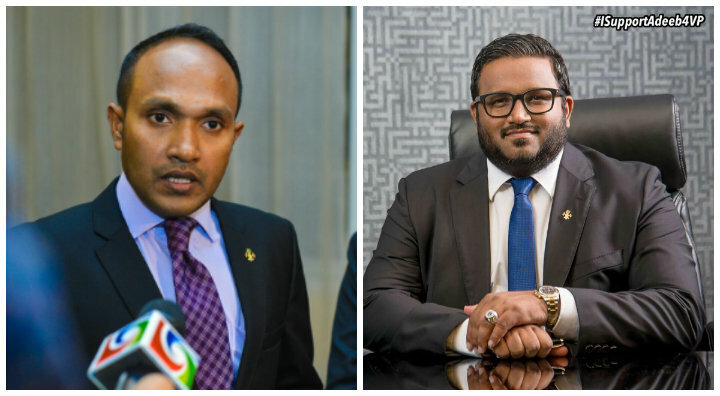 In the Viber group, tourism minister Ahmed Adeeb reprimanded newly elected Progressive Party of Maldives (PPM) MP Ahmed Faris Maumoon for his absence from a vote on a constitutional amendment that set an age limit of 30 to 65 years for the presidency and vice president. “Faris you have let down HEP Yameen on the very first vote,” Adeeb told the newly elected MP for Dhiggaru. Faris is nephew to President Yameen and the eldest son of former President Gayoom. Gayoom, is the leader of the PPM, and had opposed the change to set an upper age limit of 65 years. The former president, who is now in his early 80s, had served six terms from 1978 to 2008. 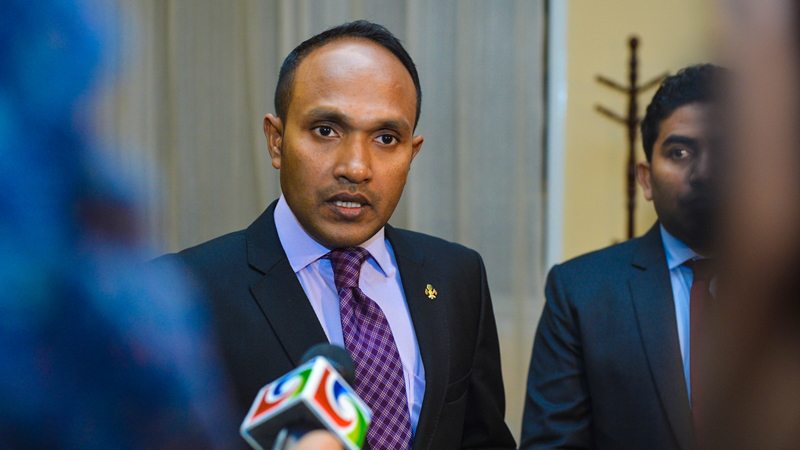 The ruling coalition is seeking to replace Vice President Dr Mohamed Jameel Ahmed with the 33-year-old tourism minister. Tensions are reportedly running high within the PPM with Gayoom also unhappy with the vice president’s imminent impeachment. President Yameen was elected on Gayoom’s popularity. But in the past 18 months, he has created his own power base, with hand picked MPs and ministers. His right-hand man is Adeeb. Several senior PPM officials have confirmed to Minivan News that screenshots of the Viber conversation circulating on social media are authentic. Faris had won a by-election for the vacant Dhiggaru seat earlier this month after former ruling party MP Ahmed Nazim was found guilty of corruption and sentenced to 25 years in prison. “Sir, I have every commitment and [support] to yourself and to the youth of our country. Especially the educated youth,” Faris told Adeeb. 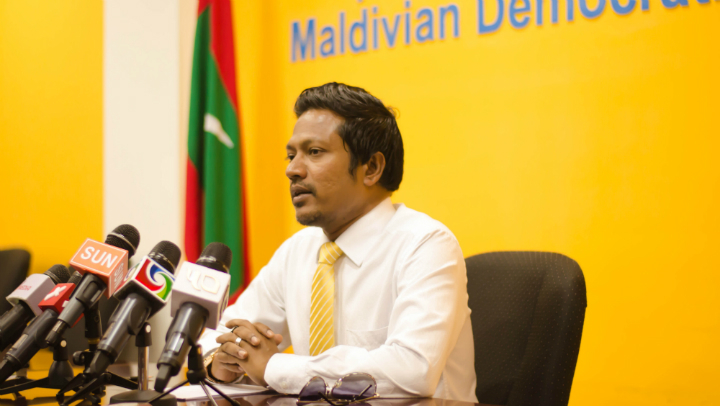 Former PPM MP Ahmed Mahloof has meanwhile called on Gayoom to retract support for his half-brother’s administration. Opposition politicians have claimed President Yameen is fatally ill and wants a loyal deputy ahead of a life-threatening surgery, but the government has denied the rumours of the president’s health. “This nation needs to be sorted and it needs to give room for HEP Yameen to rule this nation without internal resistance. We need HEP Yameen’s policies to be implemented in this nation and PPM party, there is no nation where President is not the leader of the political party he represents. “I have witnessed how difficult it is for HEP Yameen to rule with many frictions, I think we need to discuss this at party level,” wrote Adeeb. He signed off as the “Elected VP.” Adeeb is also the vice president of PPM. Addressing participants of a motorcycle rally yesterday, Adeeb said the country is very “stress free” at the moment and that there was no cause for anyone to worry. The current administration will govern the nation in a “stress free” manner, he said. Former President Mohamed Nasheed was transferred to house arrest last week based after doctors advised a “stress free environment” and rest for back pain. The opposition MPs’ backing for the constitutional amendment was widely perceived as part of a deal in exchange for the opposition leader’s transfer to house arrest.